Today I am going to talk about how to handle reading when you feel like you do not have enough time to embrace yourself into language studies, but you feel that your writing skills are quite weak/require more training. Writing is definitely based on knowing certain phrases. Just remember starting academic essay even in your mother tongue – when you still have nothing to say, you start with template phrases (Minun mielestä / Uskon että / Ongelmana on se, että…). Feeling unconfident about using such basic phrases may make your writing language unstructurised or may make yourself feel a bit of unconfident. Myself, I found two ways to make and update my own phrase bank. Second, motivate yourself to read columns in the newspapers and highlight phrases that catch your attention. 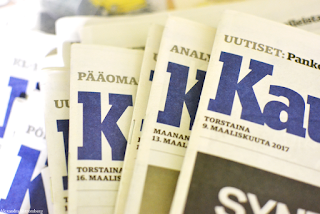 I usually read Kauppalehti - I have a free subscription thanks to my student organization. Columns there have quite lively discussions. HS Metro is also a good choice – there you do not have an excuse that you do not have time to read it. You can easily spare at least half of your commuting time to reading, because working or studying in the public transport anyway demands more concentration than reading small and light-minded articles and comments. After taking a newspaper home and highlighting useful words, you can take a pause and a day or later write them in your laptop or on the usual paper. There you can use different colours to highlight grammar structures, different topics and unknown words.For me, it is a good tactic to take a break between rereading articles to make sure that I have remembered new phrases and grammar constructions.